Animation is all around us, whether within the mainstream or the more avant-garde. From Steamboat Willie, through the Disney classic films, The Beatles' Yellow Submarine, Akira, The Simpsons to Avatar; all use animation techniques to tell their story. 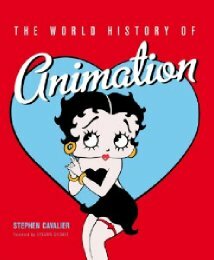 Stephen Cavalier has collated a rather lavish and beautiful book that essentially tells the story of World animation. The book is broken into three distinct sections comprising of the film age, the television age and the digital age and is organised chronologically. With a foreword written by Oscar-nominated director Sylvain Chomet, Cavalier shows how animation has evolved over the last century and a bit by showing us what he considers to be animation highlights in year order. plenty of great stills and illustrations. Therefore overall not really a tome for those interested in the detail but perfect for those who just want to increase their knowledge of the field.